Providing power for work operations in areas where connection to the local power grid is either impractical or unavailable presents a common challenge for most large scale contractors. Remote jobsites in undeveloped areas, nighttime roadwork, high traffic areas, offshore jobsites and more present special power supply challenges that require contractors to provide and produce their own sources of electrical power for operating all manner of equipment, from lighting and power tools, to portable onsite offices. Given the high costs of operations, the large scale, and the high powered nature of most commercial grade equipment commonly used on construction sites, power and cost management requirements are usually correspondingly high. As a result, providing ample electrical power to maintain productive operations involves more than simply providing an adequate amount of electrical power. On worksites where all power is produced independently of the local power grid, productivity, safety, quality, and profitability are key areas of concern. The reliability of power supplies is tied to several key areas of operations, which have great bearing on the profitability of the operations as a whole. Everything from keeping equipment running for the maximum number of work hours to the effectiveness of onsite lighting have a direct effect on the productivity and costs associated with completing a given project. When equipment is not running due to either loss of power or breakdowns, productivity and thus profit is negatively affected. When illumination during nighttime operations is inadequate or fails, safety as well as productivity is reduced. Without reliable and adequate power, the communications, management and planning from on site offices becomes more difficult and less effective. For most intents and purposes, every aspect of operations on a remote jobsite is critically dependent upon a reliable source of electrical power. There are several ways electrical power is provided in operations independent of local power. Each has its own advantages and drawbacks, and the most effective method for providing power is highly dependent upon site conditions, location, and cost management. The most commonly utilized methods for powering electrical equipment on the remote jobsite involve portable generators that can be towed to the site and run independently for extended periods. For large operations, these units are typically diesel powered and can produce large amounts of electrical power for anywhere from 24 to 80 hours depending upon the model and fuel capacity. Because of their high output and general reliability, diesel powered generators are the power source of choice for most stand alone job sites. However, although these generators are capable of producing large amounts of power consistently, they also hold several serious drawbacks that greatly reduce their cost effectiveness. Chief among the problems of operating diesel generators are fuel and maintenance requirements. Particularly on large sites, a couple of large diesel generators can consume thousands of dollars worth of fuel in a short period of time due to the heavy loads placed upon them. Keeping these units running requires frequent maintenance to ensure that power is uninterrupted and involves regular cleaning, oil changes, greasing, filter replacements and the like, which are best served being done by a qualified mechanic, which of course amounts to higher operational costs. On construction sites noise is not normally too serious a factor, but the fumes and routing of electrical cable associated with operating generators can pose occasional health and safety hazards that must also be addressed. Reducing the load on diesel generators is one way operators can reduce the costs, safety, and reliability concerns associated with operating them. Although it is difficult to reduce power requirements due to the nature of the work and the minimum amount of power required to maintain productivity at acceptable levels, the loads placed on the units can be reduced by using alternative energy sources to supplement their output. One method that is growing in popularity is the implementing of alternative energy sources like wind and solar power into the job site electrical network. Solar power in particular is proving effective in reducing the load on fuel powered electrical sources by taking over some of the less demanding electrical loads of the workplace. Jobsite illumination is one area where solar power is being utilized with great effectiveness, resulting in reduced loads on generators and a corresponding decrease in fuel consumption and reduced maintenance costs. Solar powered lighting systems at their basic level involve a platform for deploying solar panels, a battery bank for storing power, and a regulating system for managing power storage and distribution. They are usually towable and can be deployed anywhere a traditional generator or light system can. There are few, if any, moving parts, and all power is generated without the need for any external fuel sources. Reliability for these systems is high, with most issues stemming only from the availability of access to adequate amounts of direct sunlight. Even with allowance for cloudy days when the total available amount of sunlight is reduced, these solar powered lighting systems still produce significant overall improvements in on site energy production efficiency that lower the overall costs for producing power. 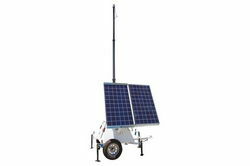 Solar powered light systems like Larson Electronicss’ 600 Watt Solar Power Generator with Light Tower Mast can be deployed on job sites instead of normal standalone light towers that require connection to external generators or power sources. By removing lighting systems dependent upon on site generators, the overall electrical loads on the generators is reduced, producing a resultant drop in the fuel consumption of those generators. With available LED lighting technology capable of being combined with these solar powered units, generous amounts of light can be produced with very low operating costs. Maintenance expenses are also reduced as there are no moving parts to service, all circuitry is solid state, the LED lamps used with these systems require no relamping for several years, and the reduced loads on the fuel powered generators reduces their overall wear rate. Depending on the number of units employed and the size of the worksite, thousands of watt hours worth of fuel savings can be realized, resulting in thousands of dollars in fuel costs removed from operating expenses. Although powering the remote work site can be quite challenging and expensive, modern advancements in portable power production are providing opportunities to reduce these costs while still effectively meeting the challenges. No longer within the realm of fringe or high dollar investment, solar power is proving effective for practical commercial operations on an increasingly large scale. With increasing fuel costs and a the list of real world successes for solar energy getting longer, alternative energy is now a viable opportunity for contractors to save money without affecting performance.